HeLa cells, the first cells ever to be grown immortally in culture, have supported some of the greatest scientific achievements, including the development of the polio vaccine and the discovery that the human papilloma virus can cause cervical cancer. They were sampled in 1951 from the cervical tumor of a woman named Henrietta Lacks who died at Johns Hopkins Hospital in Baltimore of cervical cancer, and in the years since they have contributed to more than 60,000 publications. Now, for the first time, HeLa cells have been sequenced, and the results show that they are vastly different from ordinary human cells. Previous work had shown that they have extra copies of each chromosome and sometimes multiple extra chromosomes. The new study confirmed that there are often multiple extra copies of each gene and revealed that the chromosomes also show signs of “chromothripsis,” fragmentation and recombination events characteristic of cancer cells. 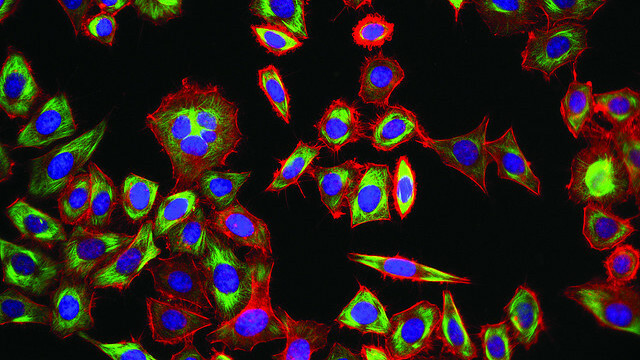 The scientists also looked at the HeLa cells transcriptome and found that 2,000 different genes—many related to cell proliferation, transcription, and DNA repair—were being expressed at higher levels than typical in human tissues. The researchers said it was difficult to tell which mutations had arisen over the many years HeLa has been in use, and whether they were results of HeLa’s cancerous biology from the beginning. Regardless, they said the full genome sequence calls into question whether the cell line is a good model for the study of human physiology and disease. J.J.M. Landry et al., ‘The genomic and transcriptomic landscape of a HeLa cell line,” G3: Genes, Genomes, Genetics, doi:10.1534/g3.113.005777, 2013. Researchers teamed up to sequence genomes for two distantly related bat species: the fruit- and nectar-eating black flying fox (Pteropus alecto) and the insect-eating David’s myotis (Myotis davidii) to see if they could better understand the evolution of these flying mammals. 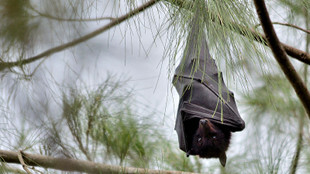 First they asked how bats had evolved flight despite the expected increase in metabolic activity that would create many damaging cellular waste products. An analysis of the modern genomes showed that their common bat ancestor had several repair pathway genes under positive selection. The researchers also hypothesized that bats would share strongly selected innate immune system genes for recognizing and fighting off disease, since bats are reservoirs for many emerging viruses that are deadly to humans, including Ebola, SARS, Hendra, and Nipah. They found that several genes related to innate immunity were indeed under positive selection. Interestingly, some of these immune-related genes were also part of DNA damage pathways, indicating that when bats began to fly, they may have also simultaneously become more disease-resistant. G. Zhang et al., “Comparative analysis of bat genomes provides insight into the evolution of flight and immunity,” Science, 339:456-60, 2013. The red alga Galdieria sulphuraria lives in hot springs filled with sulfur and toxic metals—a harsh environment for a eukaryote. A new genome sequence of the alga shows that it copes by borrowing genes from prokaryotes. In fact, 5 percent of its protein-coding genes were likely derived from other species, the researchers estimate. It’s not the first time prokaryote genes have been found in a eukaryote, but it is the first time researchers have shown that eukaryotes are using prokaryotic genes adaptively, the researchers said. The team found 75 borrowed genes, including ATPases from archaea, which may have helped them evolve to withstand heat. They also found salt and toxic metal transporters from bacteria, including a pump for getting rid of arsenic likely borrowed from thermoacidophilic bacteria. G. Schönknecht et al., “Gene transfer from bacteria and archaea facilitated evolution of an extremophilic eukaryote,” Science, 339:1207-10, 2013. 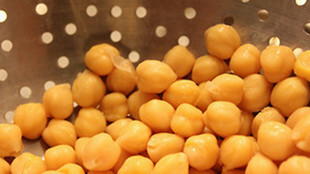 The chickpea is the second most popular legume in the world, behind only the soybean, and is an important source of dietary nitrogen, especially in developing countries. Researchers decided to sequence the chickpea genome in hopes of learning more about how to breed pest-resistant and otherwise hardier varieties. There are two types of chickpea. Desi has smaller seeds and is mainly eaten in Southeast Asia and the Middle East. Kabuli is popular globally. 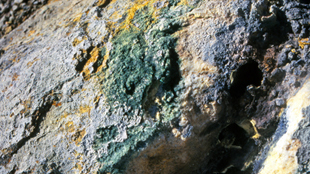 The scientists chose to sequence a kabuli variety called CDC Frontier, which is resistant to two major fungal blights. To get a better sense of chickpea evolution, they then sequenced 29 other varieties of chickpea of both kabuli and desi strains from around the world. The team found 187 putative disease-resistance genes. By comparing highly bred chickpea varieties with local varieties that evolved more naturally, the researchers found that 122 genes appear to be under selection in bred varieties, including genes for flowering time, which are useful to understand for farmers interested in growing chickpeas in various climates. The desi variety is more diverse than the kabuli variety, likely because kabuli have undergone further selection following domestication to make them fit the form that people now consider to be the chickpea. R.K. Varshney et al., “Draft genome sequence of chickpea (Cicer arietinum) provides a resource for trait improvement,” Nature Biotechnology, 31:240–6, 2013. Tapeworms are dangerous parasites, and few effective treatments exist to fight such infections. The worms can live undetected in their human hosts for many years and are often only detected when they are very large and surgically removing them is impossible. A team of researchers sequenced genomes of four tapeworm species. 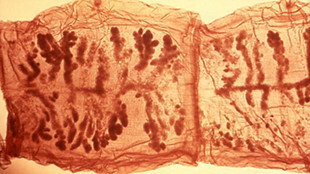 Three of the species infect humans—the fox tapeworm (Echinococcus multilocularis), the dog tapeworm (Echinococcus granulosus), and the pork tapeworm (Taenia solium)—and one species, a rat tapeworm (Hymenolepis microstoma), that is studied in the lab as an analog for a human-infecting tapeworm called the dwarf tapeworm. The researchers found that, compared to other animals, tapeworms had lost genes involved in metabolism and gained genes involved in absorbing nutrients, possibly explaining their evolution into host-dependent parasites. For instance, they are unable to synthesize some proteins, fatty acids, and cholesterol, which they now simply mooch from their hosts. The researchers also scanned the genomes for drug targets, using knowledge of successful drug targets in other organisms. They found 1,082 target proteins involved in diverse activities in E. multilocularis, ranging from protein degradation to ion transport to acidity control, and they scored their potential as drug targets. Promisingly, existing drugs already target 150 to 200 of the highest scoring proteins. The scientists plan to screen these drugs and hope to end up with new treatments for tapeworm infections. I.J. Tsai et al., “The genomes of four tapeworm species reveal adaptations to parasitism,” Nature, doi:10.1038/nature12031, 2013.